Find researchers working on a specific topic, in a given country, and find where (journals, conferences) the community publishes or meets. Browse publications, access keyword definitions and find trends in publications on phylogenetic network methods and methodologies. Locate programs to compute, evaluate, compare or visualize phylogenetic networks, and view how these are linked with each other and input data. Follow an author, publications tagged with a keyword, or the entire database using the icon in the menu, on an author's page, or on a keyword's page. What is a phylogenetic network? The classical mathematical model to represent evolution (of some species, or genes) is the phylogenetic tree. However, trees are unable to represent horizontal gene transfer, recombination or hybridization events: in those cases, some branches of the tree combine into a reticulation node, and the tree becomes a network. 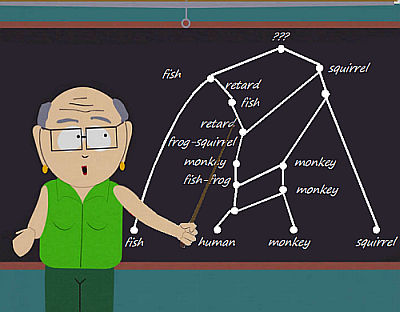 The Theory of Evolution can be summed up by this level-3 phylogenetic network according to Mrs Garrison in South Park S10E12. The main question about phylogenetic networks is how to reconstruct them from available data. This data can be of different kinds: sequences (sometimes binary sequences), distances between those sequences, rooted or unrooted trees, triplets (rooted trees on three leaves), quartets (unrooted trees on four leaves), splits (bipartitions of the set of leaves), clusters (subset of leaves which should appear together in the network), multilabeled trees (in the context of duplications), or even networks (to get a consensus network from the input). This question gave rise to some other ones: how to visualize phylogenetic networks (which is linked with graph drawing, except in phylogeny the lengths of the branches may be constrained), or how to compare them in the context of evaluation of the reconstruction methods. These problematics give rise to many theoretical problems, some of which are polynomial, but many of which are NP-complete. Fixed-parameter tractable, approximation algorithms, or heuristics have thus been developed to solve them. Depending on the problem adressed, and its complexity, the network used in the analysis may be an explicit phylogenetic network if it describes biological events, or an abstract phylogenetic network if its edges may not be interpreted biologically. A popular example of abstract network in the literature is the split network which can be used as a visualization of a set of incompatible phylogenetic trees, therefore giving some understanding on the conflicts present in the data. These categories were built collaboratively by the participants of the workshop on Distinguishability in Genealogical Phylogenetic Networks at Lorentz Center in Leiden on 2018-08-16.